This set of three images taken three seconds apart by NASA's Curiosity rover shows the larger of Mars' two moons, Phobos, passing in front of the sun on Aug. 20, 2013. The 1-ton Curiosity rover snapped pictures with its telephoto lens as Phobos, the larger of Mars' two tiny moons, blotted out much of the solar disk on Aug. 20. 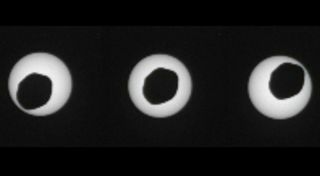 Phobos does not completely cover the sun as seen from the Red Planet's surface, so the Aug. 20 event was an annular or "ring of fire" eclipse, like the one that wowed skywatchers here on Earth from Australia to Hawaii in May of this year. Phobos is just 14 miles (22 kilometers) wide on average, and the other Martian moon, Deimos, is even smaller. Many scientists think both natural satellites are asteroids that were captured by the Red Planet's gravity long ago. The tiny Phobos appears to take a relatively big bite out of the sun because the moon orbits so close to Mars — just 3,700 miles (6,000 kilometers) from the planet's surface. Earth's much larger moon, by contrast, zips around our planet at an average distance of 239,000 miles (384,600 km). Phobos takes eight hours to complete one lap around Mars, while the more farflung Deimos (average orbital distance: 12,470 miles, or 20,070 km) orbits once every 30 hours or so. But neither moon will be in its current orbit forever; Deimos is speeding up, while Phobos is slowing down. Scientists think Mars' gravity will probably destroy Phobos, perhaps in the next 10 to 15 million years or so. Observations of Phobos and Deimos by Curiosity and its older, smaller rover cousin Opportunity should help researchers refine their knowledge of the two moons' orbits, Lemmon said. "This one is by far the most detailed image of any Martian lunar transit ever taken, and it is especially useful because it is annular," he said of the Aug. 20 eclipse. "It was even closer to the sun's center than predicted, so we learned something." Curiosity landed on Mars on Aug. 5 of last year to determine if the Red Planet could ever have supported microbial life. The rover has already checked off that primary mission goal, finding in March that a site called Yellowknife Bay was indeed habitable (though not necessarily inhabited) long ago. Curiosity is now embarked on a months-long trek to the base of the 3.4-mile-high (5.5 km) Mount Sharp.